I made a skirt. I couldn't come up with a more creative way to introduce this post, so there it is. 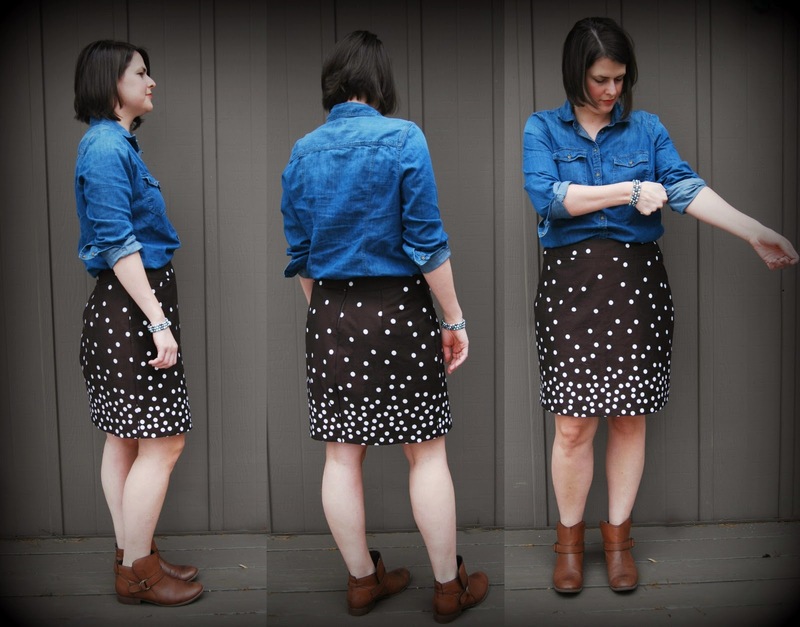 I sewed a skirt. Holy cow that's some pasty skin. Spring is arriving in my neck of the woods but I've yet to be out in the sun. 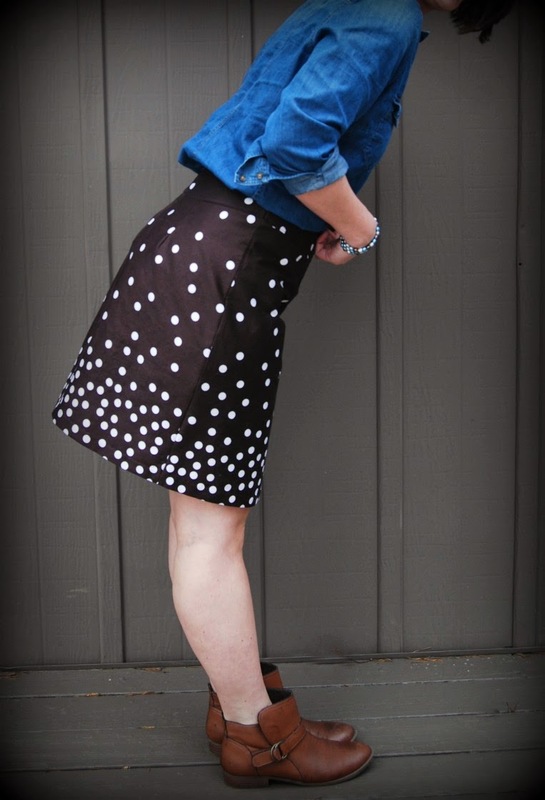 I am pretty pleased with this particular skirt, mainly because the fabric is special to me. The fabric was given to me by Carolyn of Diary of a Sewing Fanatic. She sent me a box of fabric after pledging to give away some of her stash. I wrote at the time that Carolyn sensed I needed a pick-me-up but I don't think I've ever told her the whole story. Carolyn emailed me about sending this package the same week that J was being diagnosed. During that terrifying week where we knew that he had some form of cancer, we just didn't know exactly what type. I was driving back and forth to the hospital trying to take care of him as best I could as well as a three month old baby. It was insane. I have to say, that was the worst part of the whole ordeal- the unknown. The email I got from Carolyn was just the pick-me-up I needed. It was a little slice of kindness and normalcy that I really needed at the time. It sounds silly, I know. It's just fabric. But I really needed something positive right then at that exact moment. And who wouldn't be excited about free fabric? Am I right, or amiright? I originally thought this fabric was black. I kept looking at and thinking that there was something strange about the color. I finally saw it next to something black and realized that it's not black. It's a super, super dark brown. Like dark espresso brown. That made me like it even more. I decided I wanted to make something simple with it to focus on the fun border print. I went for a skirt since I can't wear any of my old handmade skirts anymore. I'm not sure I'll ever be able to either. I am back down to pre-pregnancy weight (ok, well, close enough... :D) but my mid-section is most definitely not the same as it used to be. So some new skirts are in order. I need to quit harping on the post baby body issues, but it's just so weird to me. That so much can change in such a short amount of time. 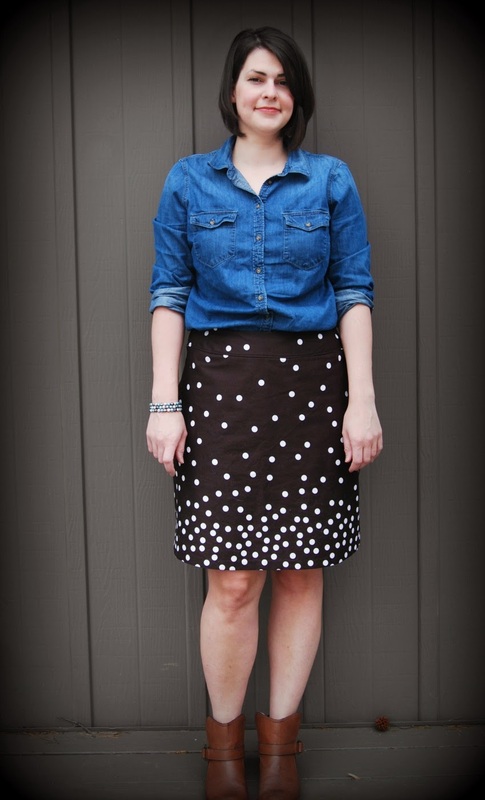 I used this a-line skirt pattern, Simplicity 1717. I went up a size from what I used to sew. Since I can't be sure of any alterations I need anymore, I decided to follow the "amazing fit" instructions where you baste everything together and then check the fit before you rip it all out and sew up the skirt. I did all the basting, tried it on and.... it fit. Ha. It fit well enough for me not to worry about any alterations. That's the way it goes. I did err on the side of being too big which I think contributed to the issue I talk about below. 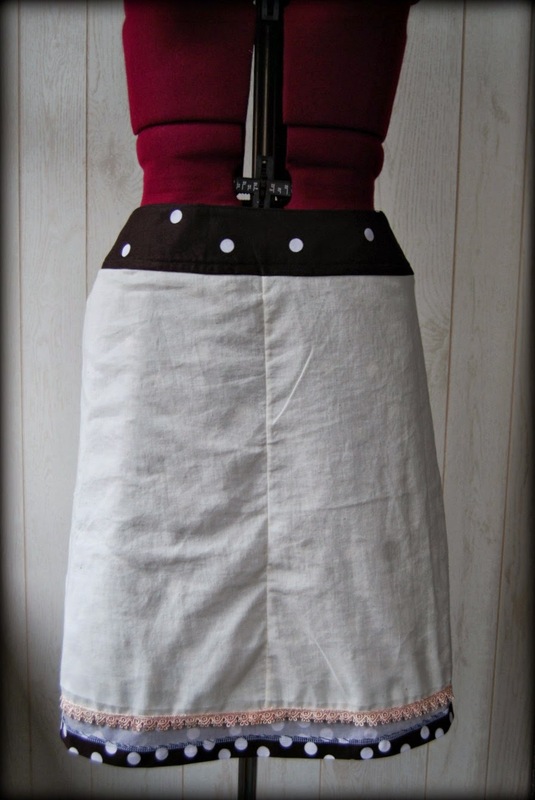 I lined the skirt in muslin. 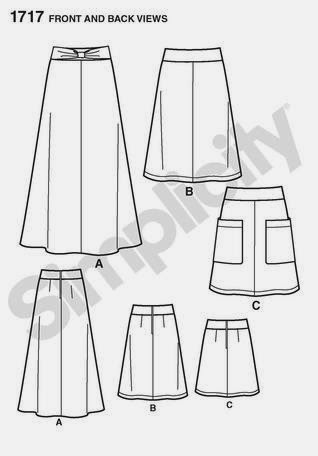 The skirt pattern does not include a lining. I just cut the skirt pieces and sewed them to the yoke facing. 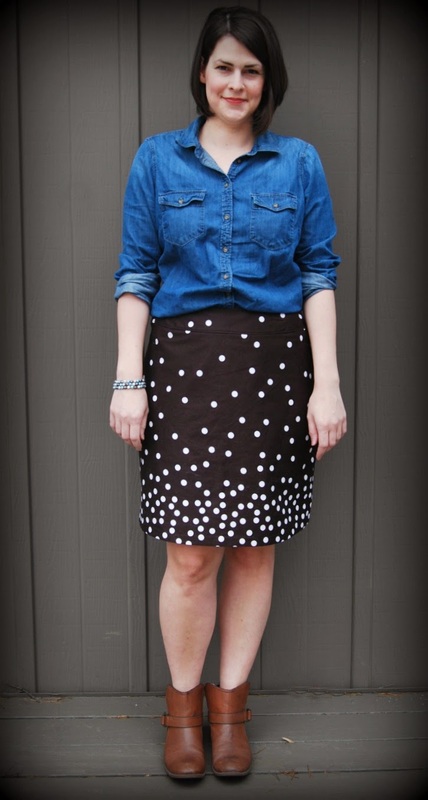 I'll definitely do that again if I make this skirt pattern up again. The lining makes it feel a little more polished. Nothing like a pretty lining to make your handmade makes special. I went with muslin to keep it cool for summer. I put in a regular dress zip by hand and slip stitched the hem (not invisibly). The finish is pretty nice on this skirt if I do say so myself. I still have quite a bit of this particular fabric left which I'm thinking I want to make in to a pair of shorts. 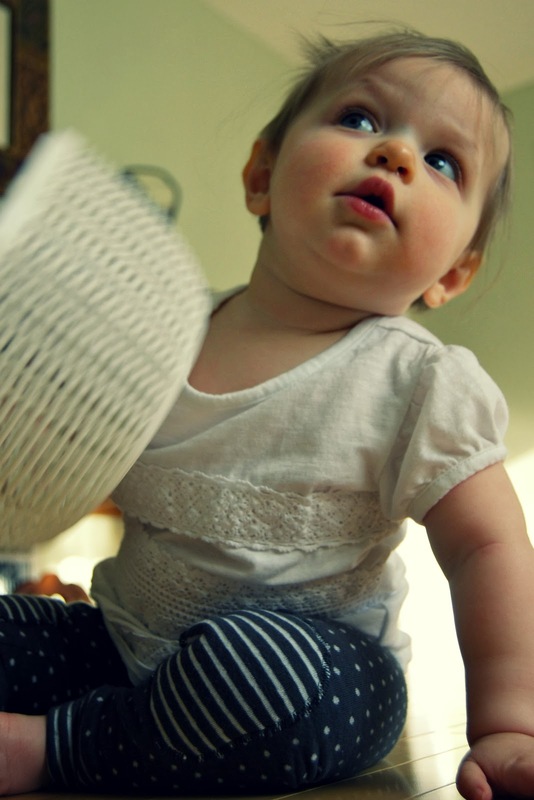 What do you do when you have a crawling baby and nothing but hardwood floors in your house? 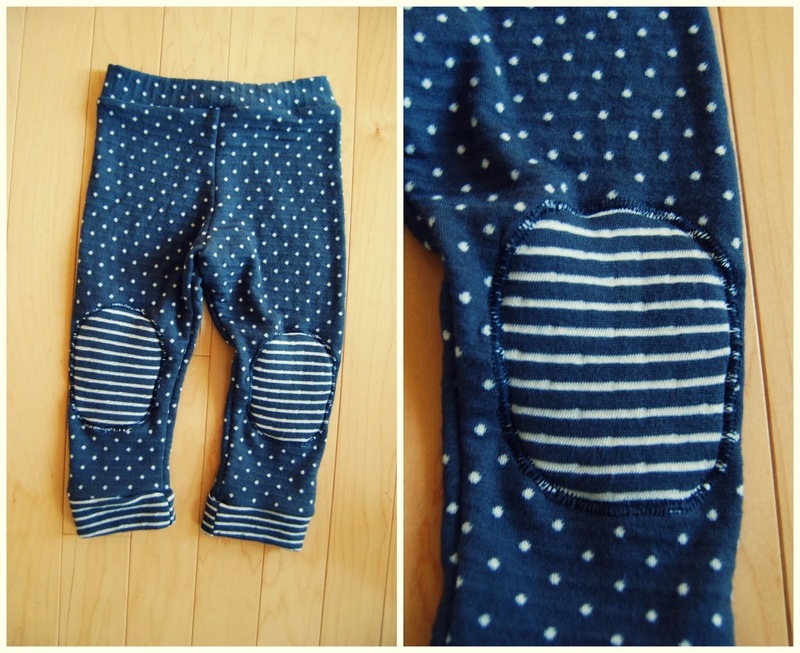 Make some crawling baby pants--- with padded knees! Baby Jane has been crawling around for a while now. 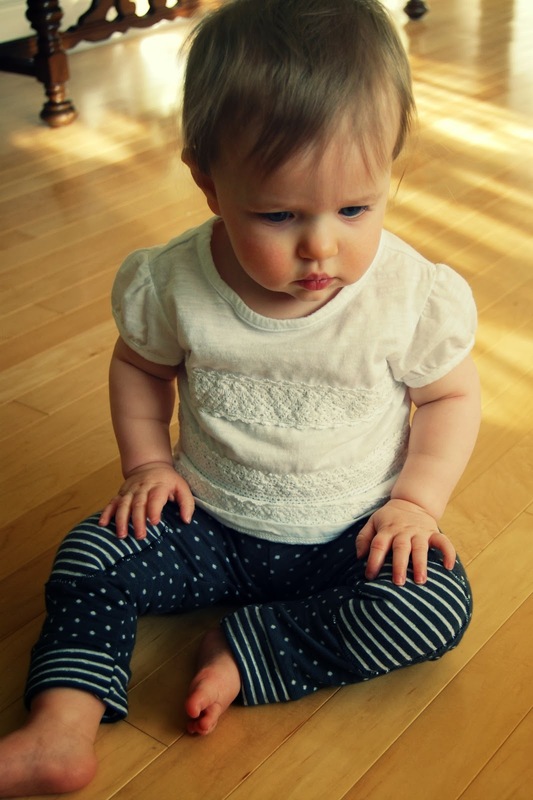 But when she first started crawling, her little knees would get so red and raw. In fact, after her first big day of crawling I noticed that she took it easy the next couple of days because her knees hurt. We have a couple of big area rugs in our house, but otherwise it's all hardwood. Pretty tough on little baby knees. My mom and my aunt both bought her an adorable pair of knee pads. I don't have a picture of them, but the actual knee pad looks like a piece of foam (or maybe neoprene?) and they are attached to a knit tube. They have some grippy stuff printed on them, too. Anyway, the knee pads were so perfect for this newly crawling baby that I decided to sew her some pants with knee pads sewn on. I made five pairs but I tweaked them a bit with every pair. The first couple pairs I made aren't great. 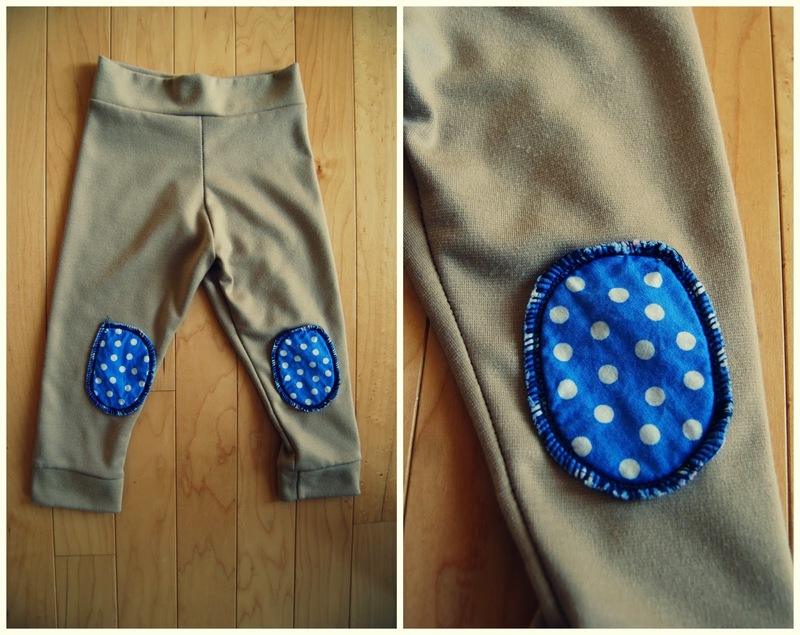 I changed around how I sewed the knee pads. So bear with me while I post a picture of each and talk about the pads. I want to remember what worked best in case I decide to make some of these again. Which I might. 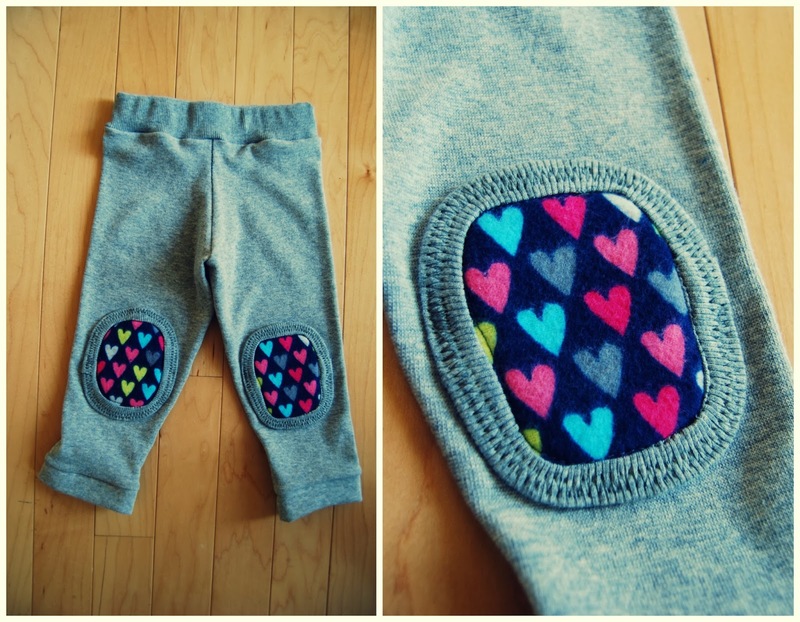 I used this baby legging pattern by Melissa Esplin. I shortened the legs and rise a little bit. The legs were really long, even on my long baby. And I shortened the rise because I added a waistband. The picture above shows the first pair I made. The pads are made of two layers of fleece with one layer of quilting cotton on top. I basted the layers together and then serged the edges. And yikes, these knee pads are homemade looking. It's really hard to serge a round patch, too. Hence the pointy bit on one of the patches. Pair number two is two layers of fleece with one layer of flannel on top. Rather than serge the edges together I decided to bind the edges with some rib knit. My stitch-in-the-ditch could use some work, I know. I didn't like this pair at first but they have become the most worn pair of the bunch. The patches are extra soft and squishy. I should also mention that there is elastic in the waistband. I tried a couple pairs of these leggings with just a knit waistband (like a yoga waistband) but found that they really needed the elastic to stay up. Jane managed to crawl out of a pair that didn't have elastic in the waist. The cuffs are just a knit band. Pair number three I used one layer of fleece underneath some crazy fluffy minky. Instead of serging or binding the edges of the patch, I zig zag stitched over the edges. 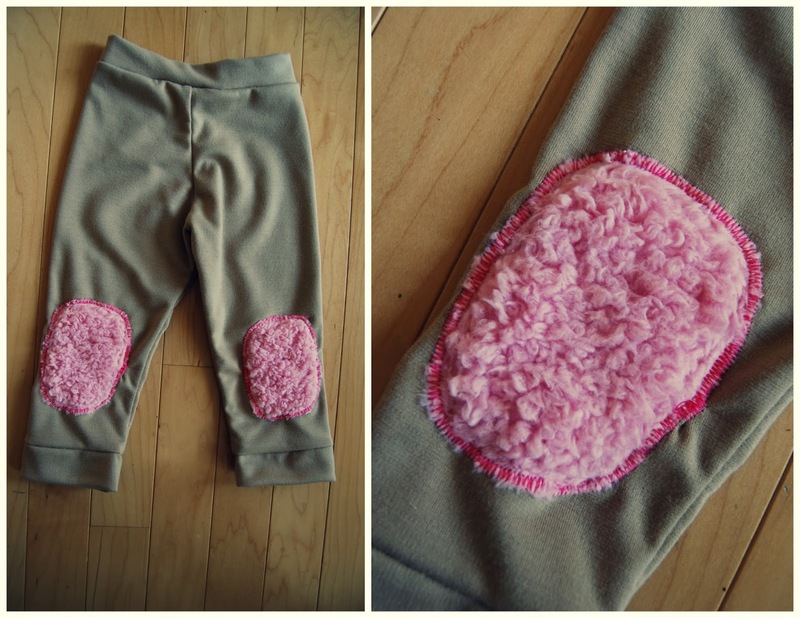 I sewed this pair in a hurry. I was sewing while listening to baby Jane on the monitor stirring from a nap. Nothing makes me panic more. Just one more seam, baby please.... :) There are some puckers around the patch that I'm not happy with. As a result, this pair hasn't been worn yet. But I think the fuzzy patches are pretty cute. The last two pairs I feel like I got it right. The patches are only two layers. The black patches are just two layers of black fleece. 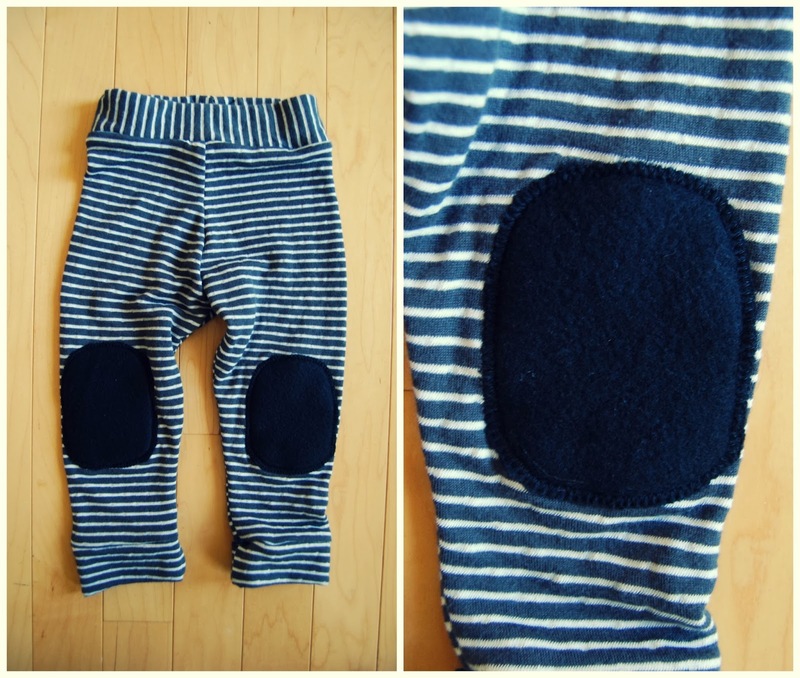 The striped patches are self fabric with one layer of fleece underneath. The patches are sewn on with a zig zag stitch set with a smaller stitch length. I also rotated the position of the patches towards the outside of the knee. I noticed on the other pairs that the patches ended up sitting slightly inside of the knee after some crawling around. Not sure why. Using a stretch fabric for all layers of the patch made a difference, too. Both pairs are made from the same fabric, some sort of reversible knit. Dots on one side, stripes on the other. 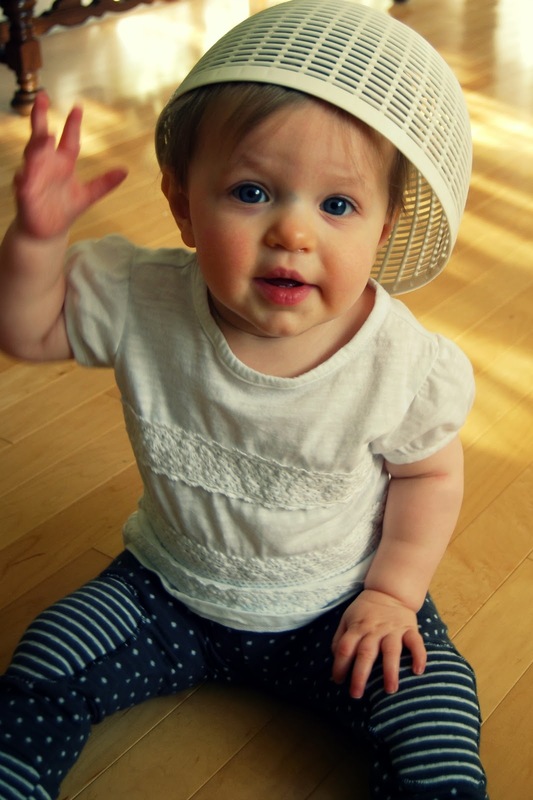 Can I just tell you how hard it was to get pictures of baby Jane for this blog post now that she's mobile? It was nearly impossible. I had to get her attention with kitchen items. She doesn't sit still for her toys anymore. It takes something new to pique her interest. In this case it was the salad spinner. And even then she only stayed in one spot for a moment. Gone are the days where I lay my sweet little baby down on a blanket and snap two hundred photos. She's on the move. To prove it, check out this stop motion video of crawling baby pants in action. It's pretty darn cute. A good way to remember this crawling phase down the road. 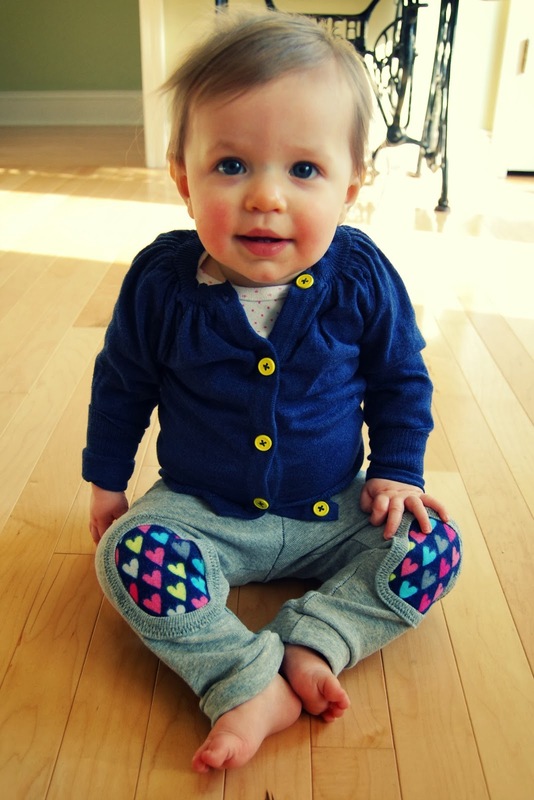 Baby Jane is ten months old now and she's just the sweetest thing I've ever laid eyes on. Can you guess why her first word is kitty? Crawling Baby Pants from Liza Jane on Vimeo.